ePublishing Knowledge BaseePublishing Knowledge BaseePublishing Knowledge Base Creating and Managing Directories & Buyers GuidesHow do I display different tabs on my directory listings for different types of content? 1. In a directory, you can assign certain content categories to appear as tabs in each directory listing. Those tabs can be unique for each overall directory. For example, if you have a directory called "Software," each company within that directory could have the same tab options for displaying content. 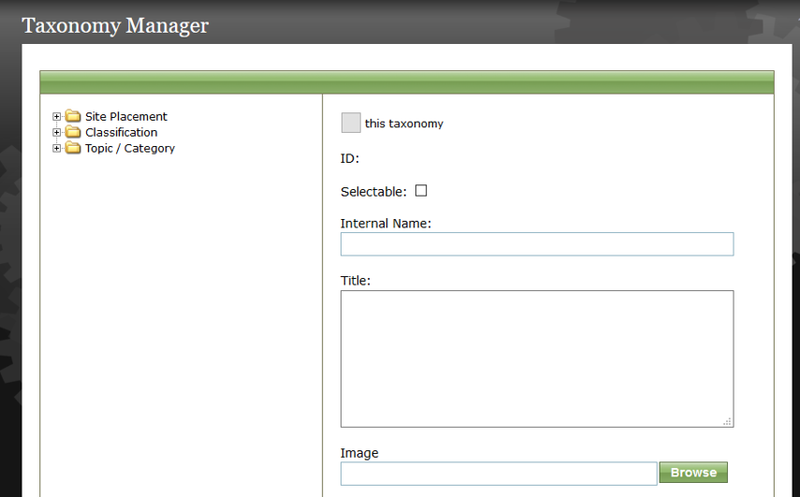 This functionality is controlled by the System Setting tool and assisted by the Taxonomy Manager. 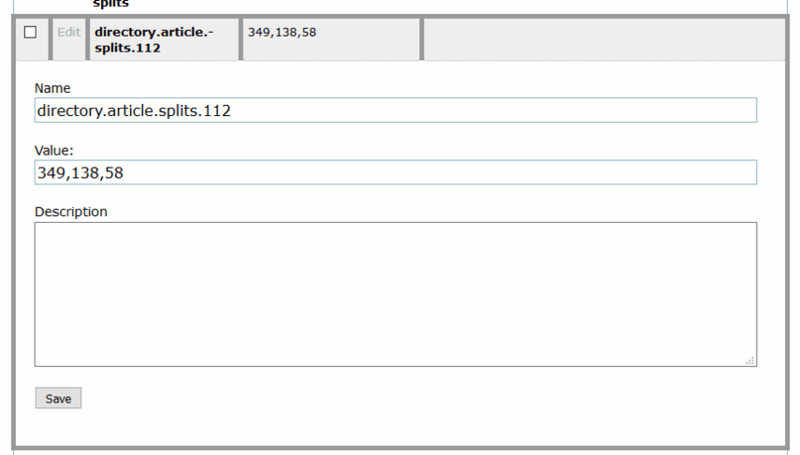 Some tabs will be automatic and set for each directory depending on your website directory design. For example, Company Profile and RFQ above will not be affected by the steps outlined in this article. Please ask your Solutions Manager if you have any questions. You may want to test changes on your stage site before changing your live website. Learn how to access your stage website here: How do I use my website's staging environment to test changes before pushing a change live? 2. 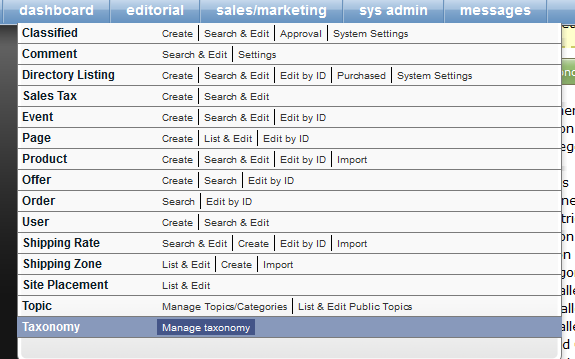 To start, go to the Taxonomy Manager, under Sales/Marketing in your dashboard. 3. Click the + sign next to Topic/Category, where you will find the categories you want to display. Zoom: Click the + sign next to Topic/Category, where you will find the categories you want to display. 4. 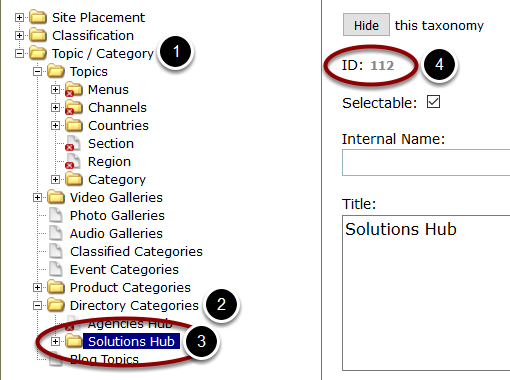 Identify the taxonomy ID number of the directory you'd like to apply the tabs to. Usually, this is found under Topic / Category > Directory Categories. 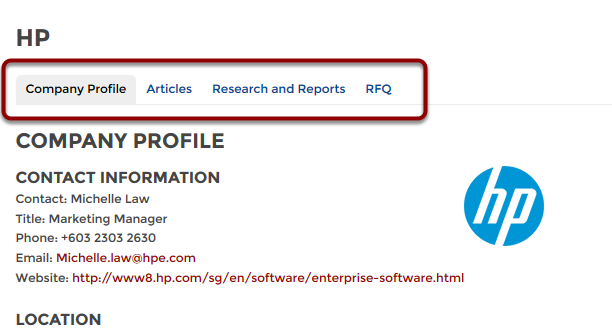 To view the ID number, click on the directory name. 5. Identify the taxonomy ID numbers of the categories you'd like to appear as tabs in listings in that directory. Click on the category, and note the ID number on the right. Categories may include Articles, Whitepapers, Research, Blog Posts and so on. 6. 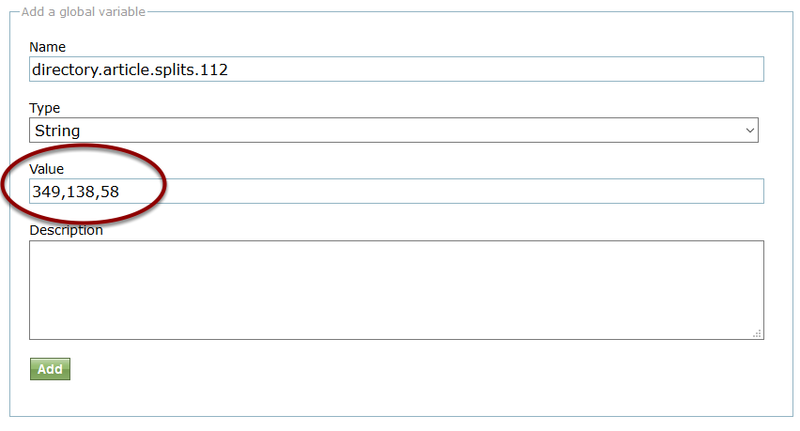 After noting your ID numbers, go to your System Settings, under Sys Admin in your dashboard. 7. Highlight and copy the directory.article.splits name. Zoom: Highlight and copy the directory.article.splits name. 8. Scroll down to the bottom, and create a new "global variable." Paste the name. Add the ID number of the directory you want this to apply to. See below for correct formatting. 9. Select String under Type. 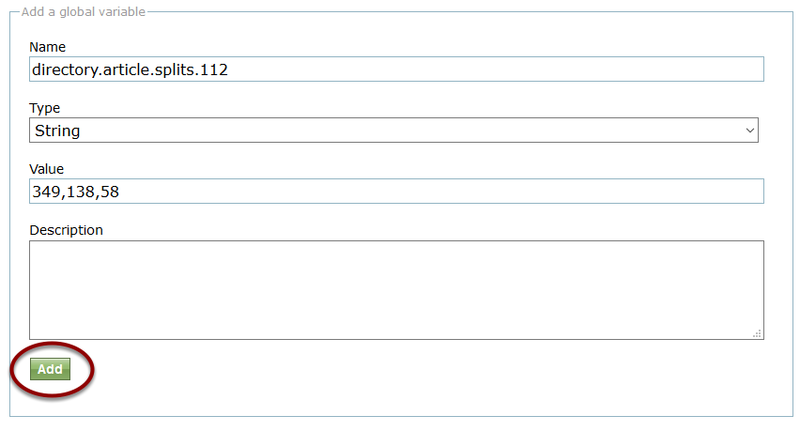 And then type your category ID numbers that you wrote down from the Taxonomy Manager. Separate numbers with a comma but no space. 10. Add a description if you'd like to leave a note for your internal staff on what this setting is for. Then click Add. 11. After adding the new directory setting, you can view or update the setup by clicking Edit. If you make changes, be sure to click Save. 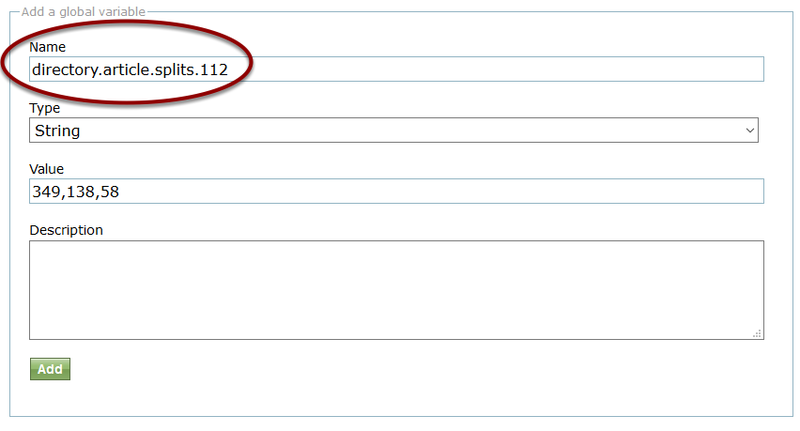 Zoom: After adding the new directory setting, you can view or update the setup by clicking Edit. If you make changes, be sure to click Save. 12. Return to the directory on the front end of your website to view a directory listing to ensure that the tabs are set up correctly. NOTE: You must have an article associated with that directory listing for the tab to appear. Prev: How do I create a new directory category? Next: How do I create custom directory listing details that will appear on my directory listing?